Date: Saturday, 3rd May 1980. 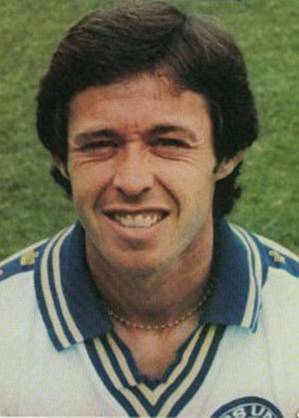 Scorers: Leeds United: Parlane, Hird (pen). Manchester United: Nil. 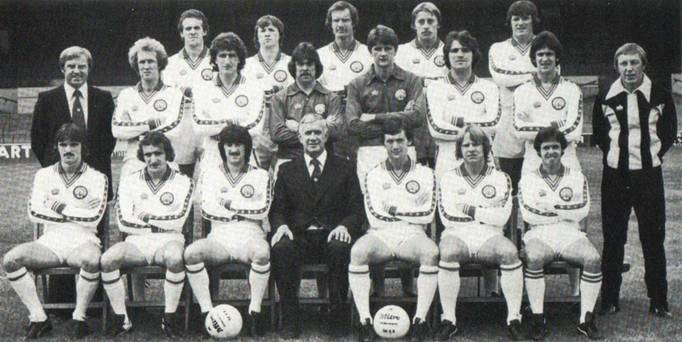 Leeds United: Lukic: Hird, Cherry: Flynn, B. Greenhoff, Madeley: Harris, Chandler, Parlane, Stevenson, Graham. As often happened with United, they had other teams’ destinies in their hands towards the end of the season. 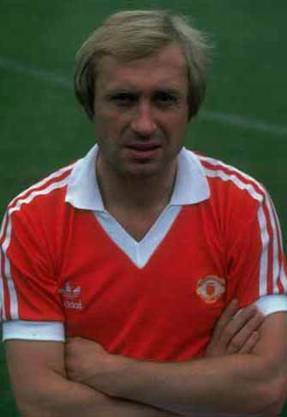 So it was at the end of the 1979-80 season when United were safely ensconced in mid-table while Manchester United were fighting out a tense struggle with Liverpool for the right to be champions and the men from Old Trafford desperately needed both points while United only had pride to play for in the last game of the season. 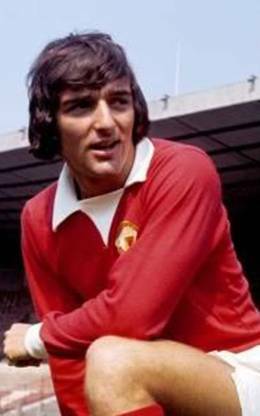 Against Manchester United pride always means everything and they unceremoniously beat their cross-Pennine rivals and handed the championship to Liverpool who pipped their fellow Lancastrians by two points, with a goal from Derek Parlane and another, from the penalty spot, from Kevin Hird. 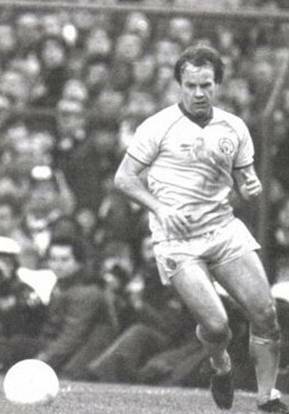 Leeds, well marshalled at the back by Paul Madeley, making his seven hundredth appearance for the club, and former Manchester defender Brian Greenhoff, turned in their most committed performance of the year. 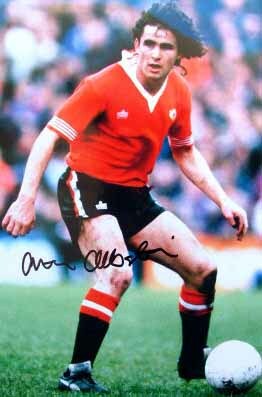 Scottish winger Arthur Graham was in lively form, Brian Flynn covered every inch of the ground with his tireless running and Carl Harris proved a frequent source of concern to Gordon McQueen and his co-defenders. 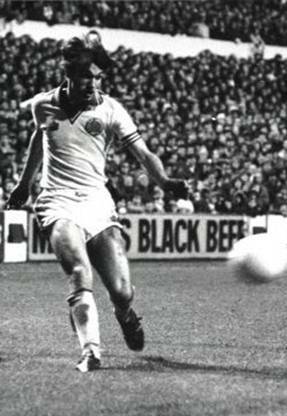 To emphasis Leeds’ determination, Cherry hit the bar with a fine rising shot and Arthur Albiston cleared off the line after Arthur Graham’s shot had beaten Gary Bailey. 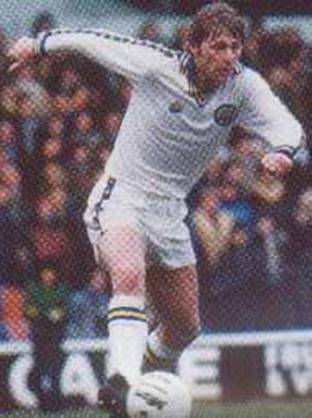 Chances were evenly shared in the second half, but Joe Jordan, one of several ex-Leeds players in the Manchester line-up, might have made better use of one opening, and Mickey Thomas was unfortunate to see one effort deflected wide by Paul Madeley. This has been a football season of too many poor sides. Its compensating excitement was stretched to the last kick by what proved to be a superficial charge by Manchester United team, which in this game had a last chance of the title, ignoring what happened at Anfield, ripped from their hands by another side, equally frantic but for different reasons. Leeds supporters were visually hungry for a final victory after their favourites’ disappointing season and this result would undoubtedly dull the urge for the manager’s head. 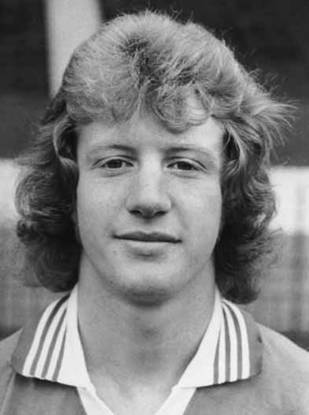 This time Jimmy Adamson did it right, not only playing two fast flankers in Carl Harris and Arthur Graham, to stretch the visitors’ back four, but successfully mining a vein in his other players by which they responded magnificently to the large and vocal crowd, the occasion, the opposition, and the long-running feud between the clubs and the hooligan elements among the supporters. A goal in each half was enough for Leeds and too much for their opponents. It was Leeds’ ability for all of the first half and some of the second, to match the visitors’ finest quality, their pace and determination, which finally decided the issue. Quite early a Joe Jordan shot was deflected by Kevin Hird, who had an overbearing impact on the game. 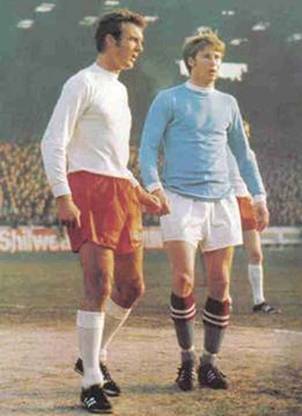 Almost immediately Manchester were given grounds to think that this might be a lucky day when Trevor Cherry met a Carl Harris pass to beat keeper Bailey with a firm shot, only for the ball to clip the top of the crossbar. 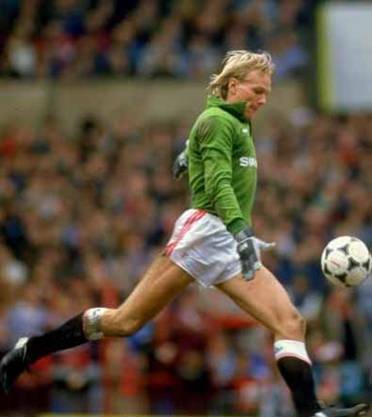 The fierce wind that was facing Leeds in the first half was causing problems everywhere and on one occasion Kevin Hird allowed the ball to squeeze between his legs and into his own side netting. 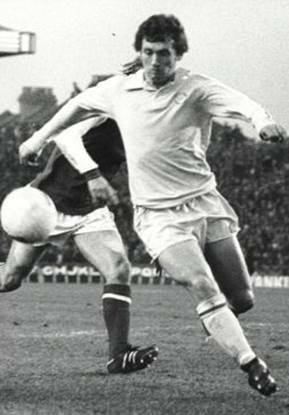 Yet Derek Parlane made no mistake in the twelfth minute, just as news reached Elland Road from Anfield that Liverpool had scored their first goal. Parlane was nicely placed some fifteen yards from goal when the ball reached him from Carl Harris through a crowd of players. His firm drive to Bailey’s right was too much for the goalkeeper and now Leeds were rampant, with Carl Harris running wild on the right and the midfield tight, Manchester’s mountain slope was tilting sharply. 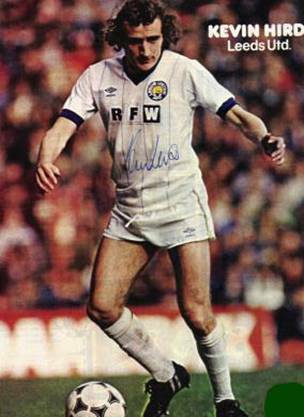 Steve Coppell did his best to restore the balance with a solo effort and snapshot, which brought out two grabs from John Lukic, and the same player was wide with another drive not too long after Paul Madeley, making his seven hundredth appearance for Leeds, gave Coppell an untaken gift. 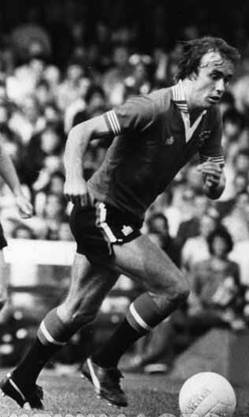 Yet all the real pressure was on the Manchester defence which had a narrow escape before the interval, when Byron Stevenson headed on for Kevin Hird and Jeff Chandler spun quickly and shot goalwards from close in. 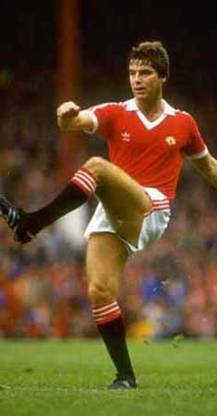 Albiston was fortunate to be in the way and deflected the ball for an unproductive corner. 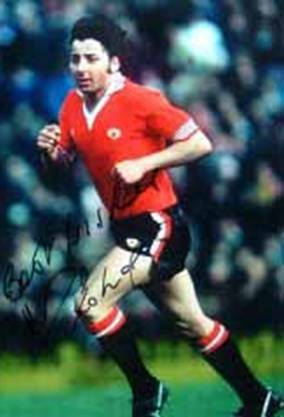 A minute before the interval, Martin Buchan tore a muscle and limped off, but his replacement, Andy Ritchie, brought added purpose to Manchester’s improved form on the resumption. 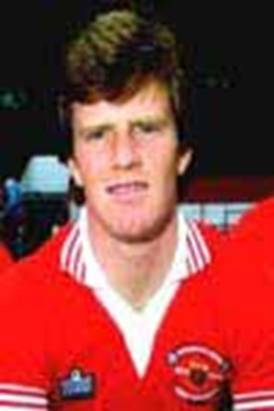 Twice the substitute made good centres but Joe Jordan headed the first almost from John Lukic’s hands inches over the cross-bar, while Gordon McQueen headed the second into the goalkeeper’s waiting hands. Conditions made things difficult for both goalkeepers. 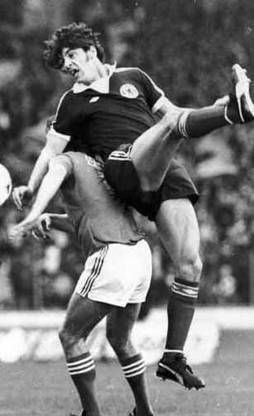 Once, Gary Bailey lost the ball in flight. It gave Carl Harris a free header into an empty goalmouth, with no Leeds player available to take advantage. 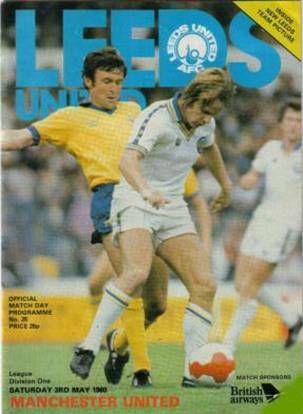 After this it was Leeds’ turn for good fortune as Manchester attacking crescendo rose to a peak. Joe Jordan served the ball nicely for Jimmy Greenhoff in open space and about fifteen yards from goal. 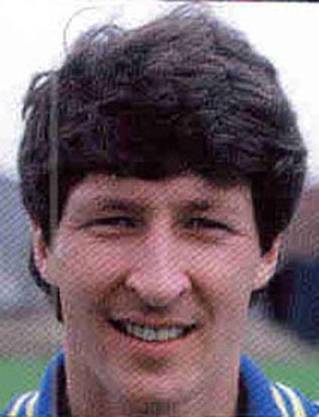 His immediate shot cannoned back off John Lukic for Mickey Thomas to strike Paul Madeley’s legs in front of an otherwise unguarded goal. 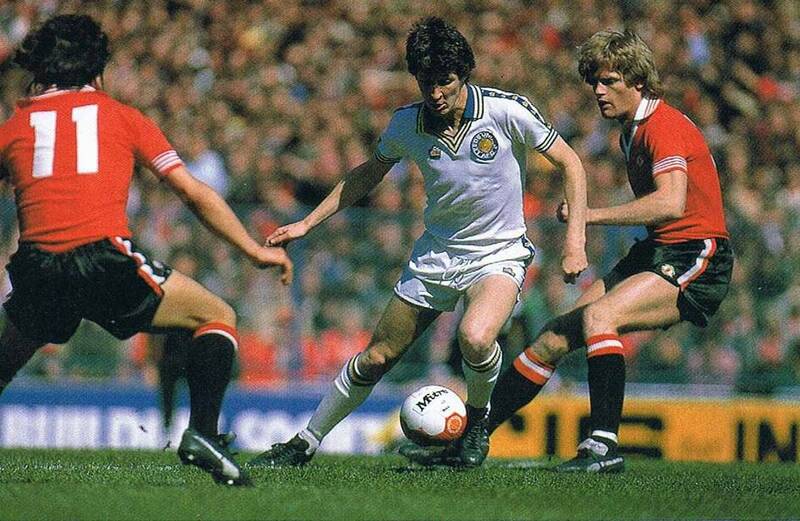 Twenty minutes from the end Leeds sealed the issue when the speed of Harris took him clear, and an attempted centre was adjudged to have been handled by Gordon McQueen. The ubiquitous Kevin Hird came up to score from the penalty spot. Manchester kept going even though all hope had now gone. They left themselves open at the back, and Derek Parlane, twice, and Jeff Chandler might have increased the margin with any luck. Yet it was to the credit of Manchester United that they may not be a composed and classical team but their willingness to chase all season gave their supporters such a run for their money. Back Row: Alan Curtis, Gary Hamson, Paul Madeley, John Hawley, Eddie Gray. John Lukic, Ray Hankin, Byron Stevenson, Syd Farrimond (Coach). 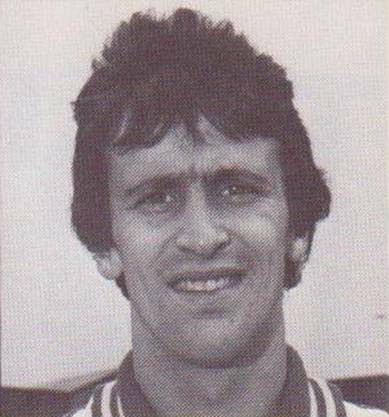 Trevor Cherry, Brian Flynn and Carl Harris all played a part in the build up for the first goal.